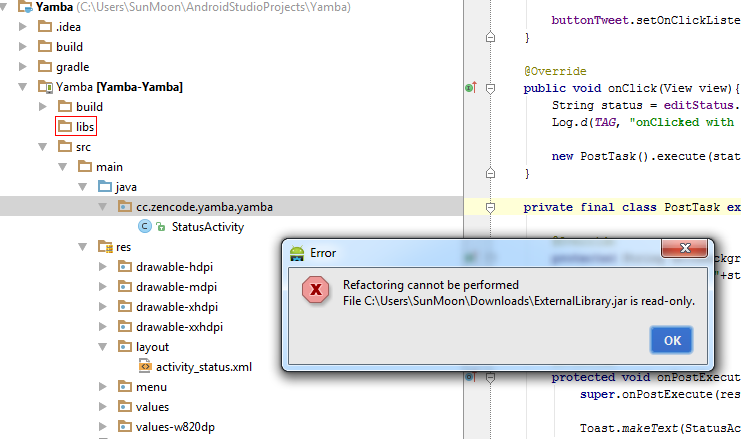 Why does it keep say “Refactoring cannot be performed” when I copy a jar file into the lib folder in Android Studio? CTRL + Drag works for importing in Windows. On a Mac you can hold down the Option key while dragging the files into Android Studio. Your error message gives you the reason. Your jar file is read-only and is not in your libs folder (right now it's in your Downloads folder). Make sure you properly copy it to your libs folder, and try the re-factor again. Not the answer you're looking for? Browse other questions tagged java android intellij-idea android-studio jetbrains-ide or ask your own question.